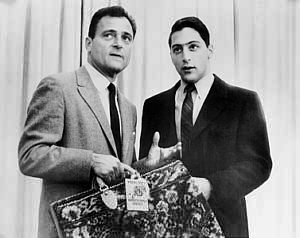 Mike Todd, the flamboyant Broadway producer, had been a partner in Cinerama Productions, and had produced the European segments in This Is Cinerama. His son, Mike Jr., had directed the roller coaster sequence that opened the film and virtually all of the material photographed in Europe. While Todd liked what Cinerama could do, he wanted to find a way to do it more cheaply and easily. Shortly before the opening of This Is Cinerama, Todd set about to develop what he called "Cinerama outa one hole". 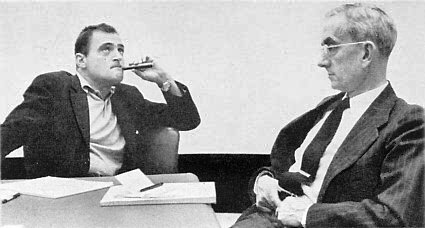 After Cinerama was declared an unqualified success, Todd sold his stock in the company in order to bankroll his search for an improved system. Mike Todd reflected in his "Bugeye" lens. Of course the photo was created in the dark room from two separate photos, one of Todd-AO camera 2 in front of a stack of shipping cases, and the other with Mr. Todd posing in front of many of the same cases. The front element of the lens isn't quite that good of a mirror. It's a clever picture at any rate. Color photos of this same lens , without Mr. Todd's reflection, are on page 3 of this section. 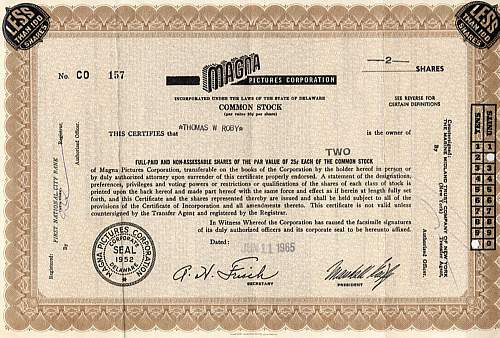 Stock certificate for Magna Pictures Corporation, the parent of Todd-AO Corp. Mr. Roby doesn't seem like a heavy investor. Todd approached Massachusetts optical giant American Optical Co. and outlined what he had in mind. To show that he was serious about what he wanted, he handed AO's Dr. Brian O'Brien a check for $100,000. In 1952, $100,000 was a tremendous amount of money and it sure got O'Brien's attention. 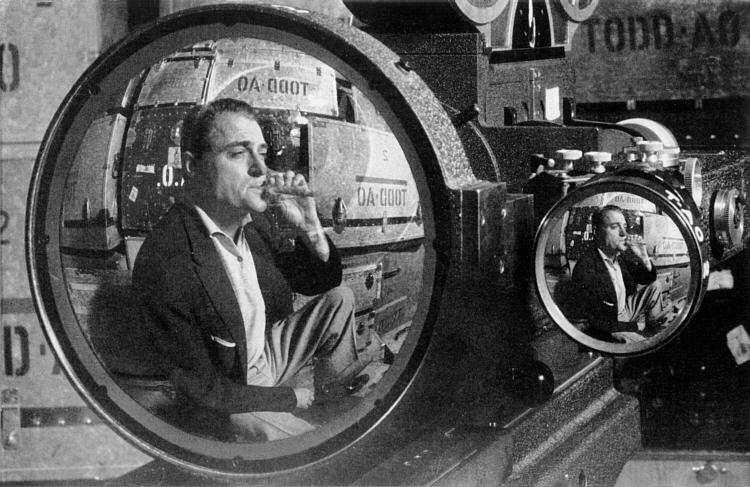 He went to work designing a single lens that could recreate Cinerama "outa one hole". The camera side of the project didn't require quite as much work as the optics. In the late 1920's, a number of wide gauge film processes were used in hopes of improving image quality in large theatres. The great depression killed the economic viability of changing the industry from 35mm to 56mm, 63mm, 65mm, or 70mm, all of which had been tried. Todd had Mitchell Camera Co. update 65mm cameras that had been in mothballs for over 25 years. The system as put together by Todd's company and American Optical used 65mm Eastmancolor film in the camera, running at a speed of 30 frames per second, with the image five perforations high and an overall frame size of nearly 250% of standard 35mm. The optical system centered around the famous 12.7mm "Bugeye" lens that photographed an image 128 degrees wide, nearly "Cinerama outa one hole". In a striking similarity to Cinerama's roots as a gunnery trainer, the optical design of the bugeye lens was born in a flight simulator designed for jet pilots following World War II. SHOWMAN AND SCIENTIST hammer out details of Todd-AO during one of many conferences where Todd mostly expostulated, O'Brien cogitated. 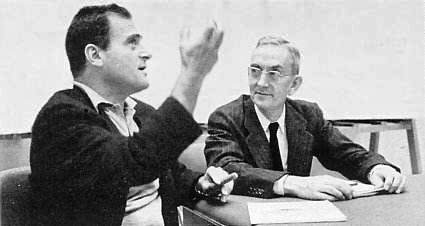 Life magazine apparently succumbed to Todd's talent as a shill when they published these Magna Corp. publicity photos of Mike Todd and American Optical's Dr. Brian O'Brien, "hammering out" details of the new process. Mr. Todd seems to be wearing the same clothes as seen in the bugeye photo at the top, clearly indicating that the photos of he and Dr. O'Brien were staged and not shot in a brainstorming session during early development of the system. But the pictures made for a good story. March 25, 1953 New York Times article on Todd-AO. Click to View. Todd and his associates kept the publicity engines running tirelessly while they developed their 65mm system that was referred to as "Magna" before the Todd-AO name was coined. At this stage there was still no mention of 70mm projection. The key figures in Todd-AO are seen together before Oklahoma! went before the cameras. 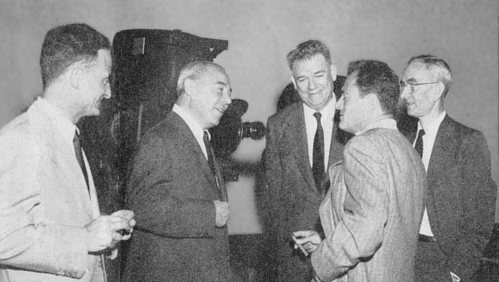 Left to right are director Fred Zinneman, Richard Rodgers, (in front of Todd-AO camera), Oscar Hammerstein II, Michael Todd, and American Optical's Brian O'Brien. Mike Todd and the man behind the man, Mike Jr. The old man had the ideas but much of what got done was the result of the direct efforts of a seemingly tireless Mike Jr. They are seen here in a television appearance promoting Around the World in 80 Days. Mike Jr. directed the roller coaster sequence that opened This Is Cinerama and most of the European segments of the film while his father searched out locations and talked people into letting the new technique shoot on their property.